You are currently browsing the The Pet Product Guru blog archives for the day Wednesday, March 7th, 2018. We have been feeding a feral cat for the past six months or so. We place the food and water out on our porch each day and everyday our new little friend comes and eats his food. As soon as I approach, he will run away but will usually come back again when the coast is clear! Frequently he’s been lying on our deck furniture but I still cannot approach him without him getting “spooked” and darting off. Why are feral cats so skiddish around humans? Here’s what PetMD as to say. Feral cats have a rough life and live, on average, two years on their own. With regular care, which includes reliable shelter and daily feedings similar to the care of barnyard cats, they can live as long as ten years. If you decide to become a caretaker, an important lesson is to never forcefully grab an outdoor cat or make a sudden movement towards it. These cats are fearful of people and tend to run away as strangers approach them. Let the feral or stray cat come closer to you on his/her terms. Through daily feedings, in time they will let you know if it’s acceptable to touch them. Another helpful hint: If you do decide to become a caretaker, squat or sit on the ground so you’re at their level when you regularly feed them. This approach indicates to the feral or stray cat that you are not threatening. 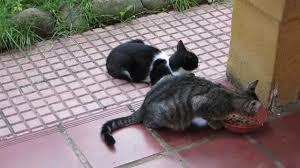 Always remember that feral cats are always on the look our for predators and humans fall into that category. The greatest variety of oldies and standards are alive on Edgewater Gold Radio! Click, listen and enjoy! Download the free Edgewater Gold Radio app or listen from our website: edgewatergoldradio.com.